Is it still summer-time? Because I’ve been seeing a ton of pumpkin stuff all over the place. Savory pumpkin recipes, sweet pumpkin recipes and pumpkin beer. I’m a little confused. 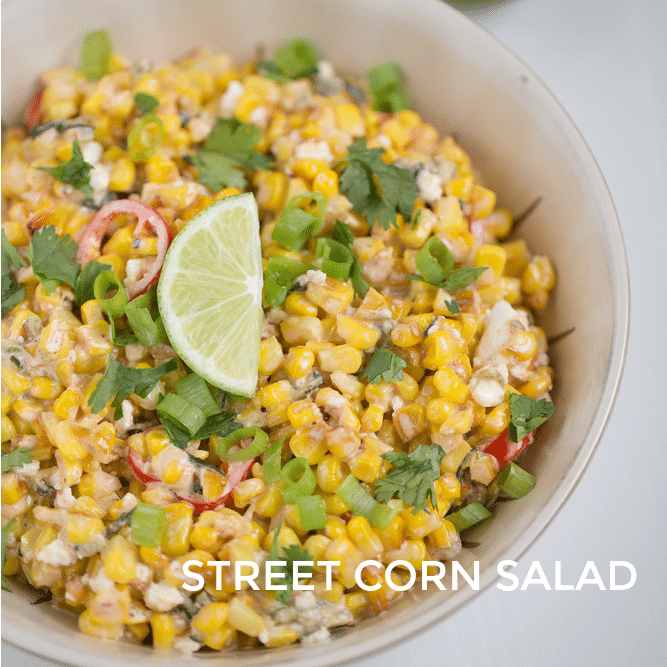 I just want to make sure it’s okay to share this street corn salad with you today, considering many people have already moved onto pumpkin recipes. Just kidding. I’m not really confused. I’ve been buying pumpkin beer since the end of July. Please, send more my way. I’ll gladly take it. I’ll drink a glass of pumpkin beer with a bowl of this street corn salad. Ain’t no shame in that combo. If you follow me on Instagram, you know that on Saturday, I jumped on the street corn salad band wagon. I made street corn salad, just like 123451354 other people have done. My recipe is similar to other recipes but different as well. My recipe includes the basics – charred corn, mayo, lime juice, queso fresco and a little heat. But the heat in my salad comes from a chopped roasted poblano pepper. I also added a couple of sliced sweet red peppers to my salad. That idea comes from a street corn side dish that is served at one of my favorite local restaurants (District Table and Bar) here in Stuart, FL. Included in the printable notes below are the options to make this recipe vegan – use extra virgin olive oil instead of butter, replace regular mayo with vegan mayo and leave out the queso fresco. If you’re adventurous, you could try adding other ingredients to this recipe to make it your own – garlic, black beans and tomatoes are great add ins. Turn on your broiler to high. Line a small baking sheet or pan with aluminum foil. Spray the poblano pepper with cooking spray. Broil 4-5 minutes or until charred. Flip and broil another 4-5 minutes or until charred. Remove from the oven and place in a bowl. Cover with plastic wrap and let sit for 10-15 minutes. This will cause the skin to separate for easy removal. Remove from the bowl and peel off the skin. Chop the pepper and place in a mixing bowl. Cut the corn from the cob. Heat the butter or olive oil over medium high heat. Add corn and cook 8-10 minutes or until charred. Toss a few times to mix to evenly distribute charring. Place the corn in the bowl with the chopped poblano pepper. Refrigerate to cool. Once cooled, stir in sliced red peppers, mayo, lime juice, salt, pepper, chipotle powder, and Queso fresco. Garnish with cilantro and green onion and a wedge of lime, if desired. To make this recipe vegan: use extra virgin olive oil instead of butter, replace regular mayo with vegan mayo and leave out the queso fresco. I never know what to do with sweetcorn. Glad to have found this recipe. I am going to give this a go. Looks delish. I can’t lie. I’ve been making pumpkin recipes for the last month! BUTBUT in my defense, not posting them yet. However, I’m still not ready to quite give up on summer, so this salad is calling my name! Pinned! To be honest, I have made one pumpkin recipe so far. And I will probably be making on this weekend, too! And the pumpkin beer, I cannot get enough of it. GIMME ALL OF IT! Thanks for stopping by and for the pin, too, Taylor! This looks absolutely refreshing and delicious- Totally going to be made to keep the final days of Summer here! Love street corn salad! Can’t wait to try your variation! Hope you enjoy it, Jessica! I can’t lie….I am SO excited for pumpkin! 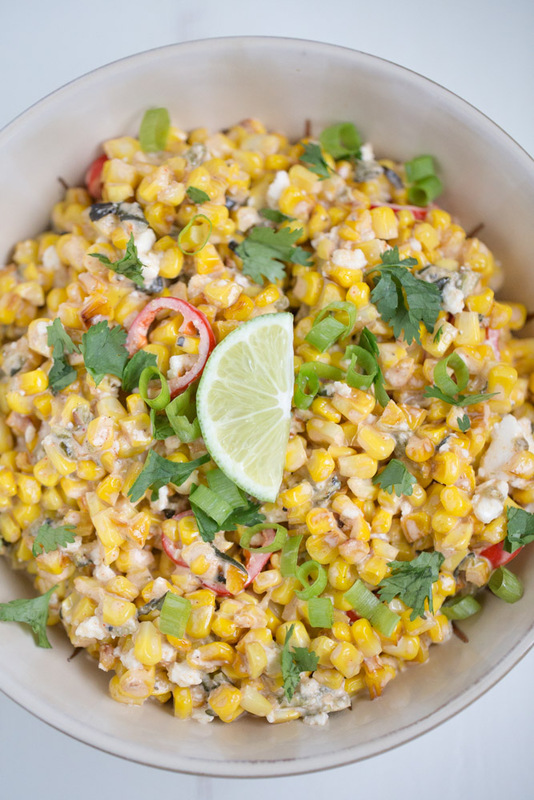 Already making quite a few recipes but corn salad is something I can see myself diving into this weekend for labor day! YUM! I haven’t made street corn salad this summer but boy do I need to. It is 90 here this week so I feel like I could totally get away with making this. Love the poblanos in this too! Such a good idea. Perfect timing to share this recipe: I want to make this for Labor Day weekend. I love a make ahead recipe for entertaining. Corn is at its peak now too. We can hold off on pumpkin for a little while longer- we’re still having a heat wave where I live. 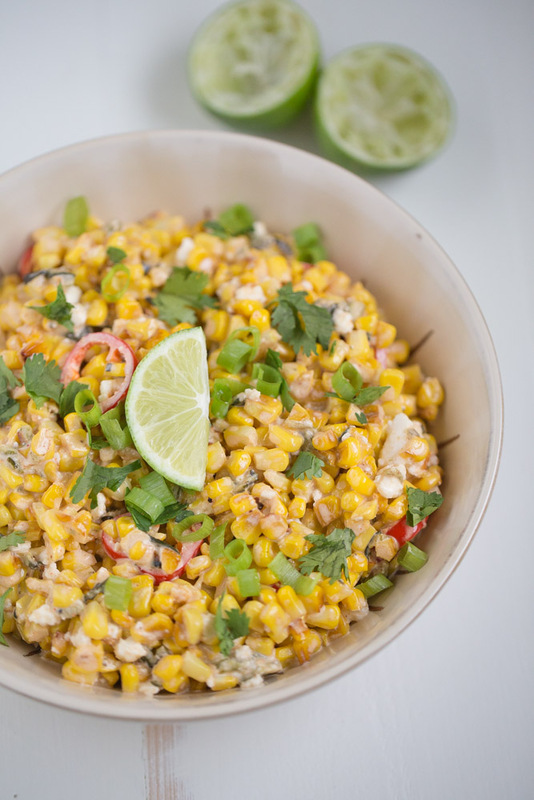 I’m all for hanging onto summer as long as possible so bring more summer deliciousness my way like this fabulous street corn salad! I know you do not want summer to end its presence, Julie! It gets cold in Minnesota, so I hear, and I will be there in December for Christmas. Brave Florida girl I am. :) I hope you have a great Labor day weekend and enjoy the salad if you give it a try. I’m getting excited for fall, but it is still a little too early :) Love sweet corn and this salad looks great! Will try it very soon! Hope you enjoy the salad, Mira! Thank you for visiting and have a lovely weekend. Pumpkin beer and street corn salad? Wahoo!!!! Great salad that I could happily eat year round, Julie. It IS still summer, dang it! So I say keep bringing on the good ‘old corn recipes! (I know I still have at least ONE to post!) AND have your pumpkin spiced beer as well! #BestOfBothWorlds. :) I love Mexican street corn, like the other 1234556778888 people out there… and I especially love when it comes in salad form. But, what I love even more? When there is a lil’ HEAT! YAAAASSSSS! Especially when it comes in the form of mellow roasted poblano pepper! Gimme Gimme! Pinned! Cheers, my dear! Thank you so much, Cheyanne! Hope you have a great “last weekend of summer” weekend! I know you have been on the pumpkin beer for a long time! 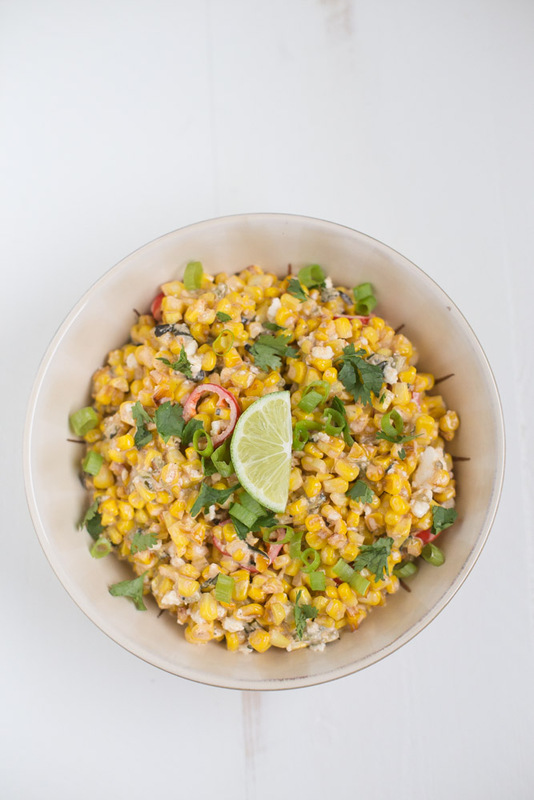 Love this refreshing corn salad!! Yes! I’d be on the pumpkin beer year round if it was sold year round. <3 Glad you like this corn salad, Zainab! I am in love with this salad! So simple but totally genius! I am grew up eating mayo corn salads, than later always making corn salads with chili and peppers but never thought of combining that 2 types. So lovely! Ah you ate some great food growing up, Evi! Thank you so much for visiting and for the comment. :) I hope you have a lovely weekend. Hi Amber, you’re welcome. Thank you for the compliment! Great salad! I totally have to try this one … pinning! Thank you, Ann! Hope you enjoy the recipe.